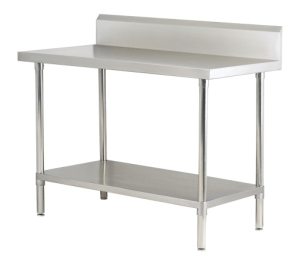 Stainless steel work tables and equipment stands are found in most every commercial kitchen around the world. Stainless steel is durable, resistant to corrosion, easy to clean, and aesthetically pleasing. These factors make stainless steel the perfect choice for commercial work tables and equipment stands. Stainless steel has been the choice material for restaurant equipment manufacturers the world over for years because of its durable finish, ease to clean, and its brilliant appearance. There are different grades and surface finishes of stainless steel to suit the environment to which the material will be subjected to in its lifetime. The most common grade of stainless steel found in commercial work tables and equipment stands is the 304 series often referred to as 18/8, another common grade is the 430 series. Commercial work tables are offered in a variety of sizes, with and without back-splashes, stationary or with casters to make them easier to move and clean behind. You can add sinks, shelves, drawers, and waste chutes to any table making them customizable to fit your specific needs. Stainless steel equipment stands are the perfect match for any char-broiler, griddle, counter-top fryer, hot plate, or any other counter-top restaurant equipment in your arsenal. Equipment stands give your equipment a firm foundation, and by adding casters it makes them easier to move for cleaning at at the end of the shift.